Get ready for a busy Wednesday. U.S. stock futures are ticking higher after China released GDP figures, and Greece prepares to hold crucial vote on its latest bailout. 1. China GDP: The world's second largest economy grew at a slightly faster pace than expected in the second quarter. Official figures out Wednesday put GDP at 7%, in line with the previous quarter, and Beijing's growth target for the full year. Growth has slowed considerably from the breakneck pace of previous years, and it's expected to drop further through to 2016. The positive quarterly numbers didn't stop falls on China's stock markets. The Shanghai Composite resumed its recent slide to close down 3%. 2. Greece votes: Greek lawmakers will vote to ratify tough economic reforms on Wednesday needed to secure Europe's latest offer of $96 billion to bailout the country. But the International Monetary Fund, one of Greece's major creditors, has warned on the viability of the bailout. The IMF said Tuesday that the country's debt has become "highly unsustainable," and it needs more debt relief than Europe has so far been willing to consider. 3. 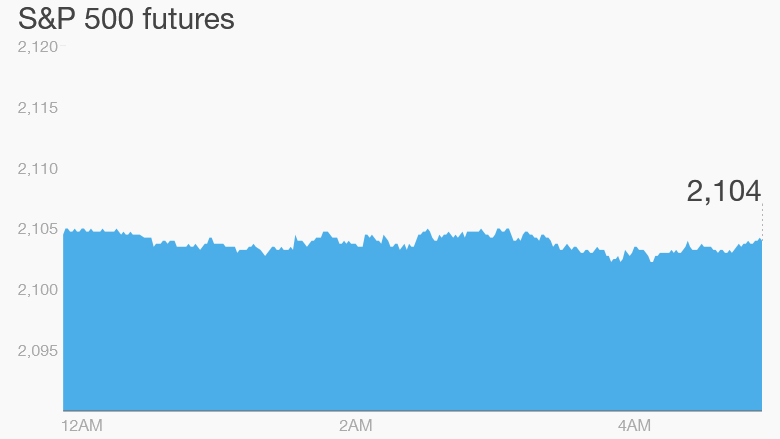 Oil dips: Crude prices have regained some poise, slipping 0.5% to just below $53 a barrel in electronic trading, after a landmark deal on Iran's nuclear program sealed Tuesday prompted a turbulent session for oil. 4. Earnings and economics: It's a busy day for earnings. Bank of America (BAC) and Delta (DAL) will report ahead of the open along with Blackrock (AOCXX). Computer chip maker Intel (INTC) and Netflix (NFLX) report quarterly earnings after the close. Netflix (NFLX) shares were rising 2.4% premarket. On the economic front, the Bureau of Labor Statistics updates its producer price index with June numbers at 8:30 a.m. ET. Numbers on June industrial production will also release at 8:30 a.m. ET. Federal Reserve chair Janet Yellen will deliver her semi-annual testimony before Congress at 10:00 a.m. ET. 5. International markets: European markets were dipping in early trading, with Germany's DAX index down 0.2% and France CAC shedding 0.3%. Shares in Burberry (BBRYF)sank 2.4% in London after the luxury fashion retailer reported slowing sales in Asia. Asian markets ended mixed. Stocks in China posted deep losses, while Japan's Nikkei index added 0.4%, and South Korea's KOSPI put on 0.7%. It follows a solid session for U.S. markets Tuesday. The Dow Jones industrial average closed up 0.4%, while the S&P 500 climbed 1.5%, and the Nasdaq added 0.7%.